The main focus in the Learjet 45 Cockpit is the avionics system. 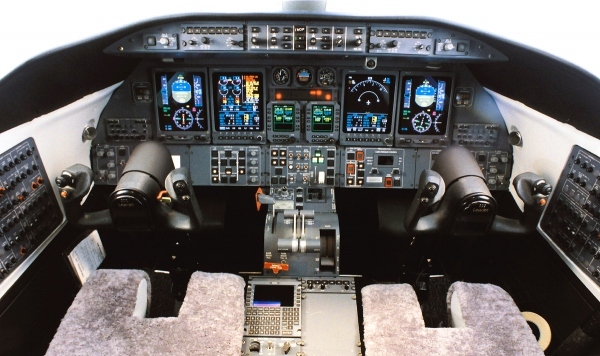 The Learjet 45 flight deck contains the Honeywell Primus 1000 avionics suite. 4 flight displays make up the Learjet 45 cockpit's main instrument displays. Two Universal UNS-1 Series FMS or Flight Management Systems are located in the Learjet 45 flight deck's console. The main control device in the Learjet 45 are two yokes that are mounted to the floor in the cockpit. The Learjet 45 XR Cockpit is mostly the same as the regular Learjet 45. There are some improvements to some of the avionics in Learjet 45 XR flight deck because it is the newer version of the Learjet 45. To find out more about the Learjet 45 cockpit avionics visit our Learjet 45 Avionics page. Above Learjet 45 Cockpit - Flight Deck photo is one of an early model of the Learjet 45 (1997-1999). Also note that the Bombardier Learjet 45 Cockpit is also known as the Bombardier Learjet 45 XR Cockpit, LJ45 Cockpit, LJ45 Flight Deck and the Learjet 45 XR Flight Deck.